V ital Link designs, assembles, and installs overhead and intermediate thrust frames and engine adatpers to hold a variety of engines. 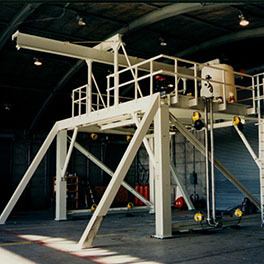 VLI has military thrust stand expertise and has completed thrust stands & adapters worldwide. 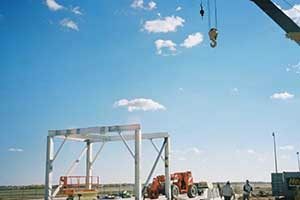 Our designs allow ample safety factors. Coupled with Atec, Celtech and NETS, our team includes over 100 engineers focused on aeroengine support. Operating factors such as utilities interfaces, easy engine adapter connection, vibration damping/isolation, hoists integration, monorail utilization, exhaust positioning, work heights determination, sub system mesh/clearances, maintenance/inspection access and worker safety are considered in our respected jet engine thrust stand designs. Vital Link has provided numerous thrust stands for ground and overhead use on Military jet and propeller engines. Now combined with Atec, our thrust stand pedigree is the world’s best for military engines. Atec’s Arachnid™ OH Thrust Stand combined with Vital Link’s upgraded adapter and linkages now provides the basis for test of the world’s most aggressive fighter engine. Following Atec’s construction of two T9 Noise Suppressors capable of testing the F135 engine for the USAF, Vital Link was contracted to provide a state of the art adapter for speedy engine change out following test. Vital Link, Celtech and Atec all have extensive adapter experience and offer attractive pricing and unquestioned capability to meet your test adapter needs.